Zoe Marks, Vegan chef and Made In Hackney cookery teacher, shares her experience of teaching a course for a group from The Stroke Project. 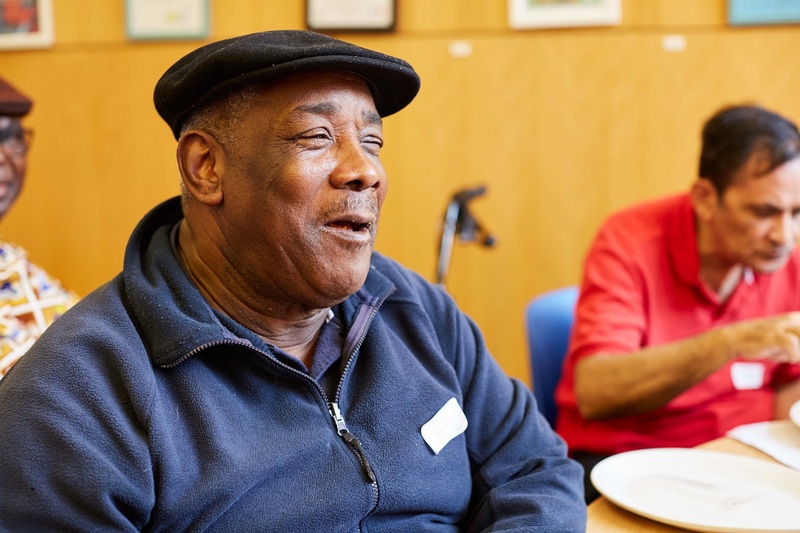 I recently facilitated a Made In Hackney 6 week interactive cookery course for a group of stroke survivors from The Stoke Project, an organisation who support and empower those affected by a stroke. We had 25 participants on the course between the ages of 49 all the way up to 90! Planning the sessions presented itself with many challenges I hadn’t anticipated, yet this was also what made the project so fun, interesting and rewarding. Made In Hackney is the UK’s only eco community kitchen. They teach people about healthy eating through interactive community sessions and have what I would describe as a ‘wholefood’ or plant based food policy - meaning no refined ingredients (including sugar), and no meat, fish or dairy. For instance, many participants had mobility on only one side of their body, making many kitchen tasks pretty difficult, although not impossible. Adding to this, many said they couldn’t be near hot water or gas. One woman explained that she used to love cooking but unfortunately since her stroke, her doctor told her that it was unsafe for her to be left alone in the kitchen because of her difficulties with remembering things such as turning the gas off. Another factor to take into consideration was that for many, a person’s taste buds can be affected following a stroke meaning that food needs to be well seasoned and punchy. At the same time, it was important not to over complicate recipes with too many steps and different ingredients because one’s memory and cognition can be affected by having a stroke. The start of the course saw mostly the women getting involved in the cooking and the men watching and making jokes from the sidelines. By the second week we had all 25 participants involved in the cooking, including the men who sat together round a table at the back of the class. There was such a great sense of humour and spirit amongst the group. People sat round sharing their food stories whilst cooking and then eating at the end. The food preparation was done in a separate room due to the size of the group and it also meant people could sit. We made a lot of raw recipes such as salads, smoothies and desserts so that we did not need to rely on gas or hot water. People were happy to divide up the different types of tasks according to their strengths and abilities. Those participants with both use of hands prepped the tougher vegetables, such as potatoes and those with mobility on one side of their body were able to team up so they had 2 hands between them; this was also an exercise of trust, some good knife skills and a great sense of humour! Doing a different type of cuisine each session meant that people were getting to try new foods or put forward ideas for cuisines they were already familiar with. The volunteers and I were were able to share our skills and knowledge and learn from each other which was great. For example, I’d had little experience in cooking plantain, so it was great that many of the participants from Caribbean backgrounds were able to demonstrate the best way to prepare them. Many were surprised they enjoyed recipes and ingredients they hadn’t thought to try themselves which they went onto recreate at home. Some who thought they would never feel like cooking again, said they would now like to cook more. ‘We have a saying, you can’t teach an old dog new tricks, but I mean in one sense yes you can. It’s very difficult for a person like me to change my habits. I enjoy this because you’re seeing what is going into the food, which is one of the most important things, and then the ingredients which are really good, yes really good for your health’. Barbara, 91 years old, told me before the course started that she never liked to try anything new, she just likes ‘plain meat and vegetables’. And yet each week she got stuck in with the cooking and trying the dishes, which ranged from a Thai noodle salad to a black bean chilli to roasted plantain, rice and beans. Many participants said they found the course helped them to cook the same vegetables but in different ways. Another woman, Valerie commented ‘What I think I’ve gained from the class, learning how to omit sugars and salts and just using vegetables alone instead of meat’. 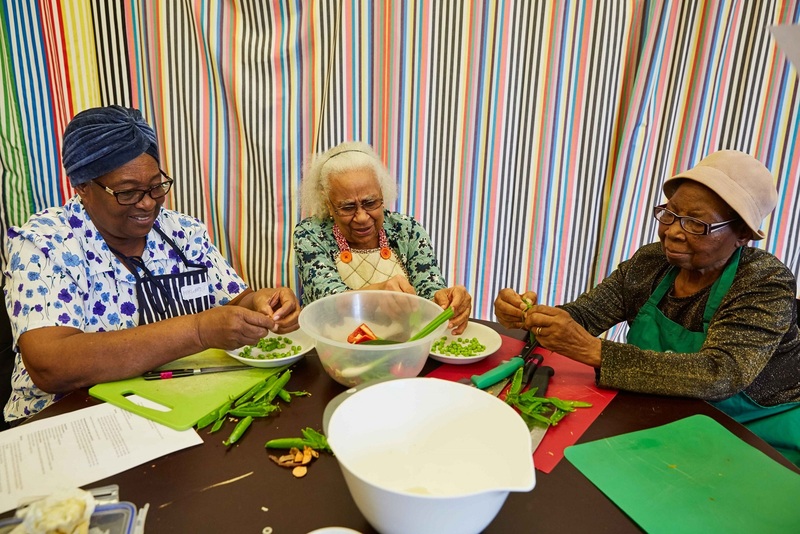 Community kitchens are a really special and fun way of bringing together people from different backgrounds. I have felt inspired by Made In Hackney and worked with so many interesting people, who are doing really amazing things around food, and this has also provided me with further exciting work opportunities. Made In Hackney’s ethos is a great fit for me. It has managed to fuse my longstanding interest in working with disadvantaged communities alongside my passion for cooking. It’s both rewarding and fun work – bringing diverse communities together in the kitchen and cooking and eating together.